There’s nothing worse than the smell of bacon filling your house — at least when you’re a vegan. I decide to go vegan after watching What the Health on Netflix specifically because someone interviewed mentioned that dairy can cause eczema, which is why I refer to myself as a dietary vegan. It’s really more about the effect the food is having on my body than the ethical considerations and that makes it that much harder not to cheat now and then (which, spoiler alert, I totally do #badvegan). But it’s going to be even harder now because Hubby has decided that he wants to do the keto diet — lots of protein, lots of fat, very little carbs. 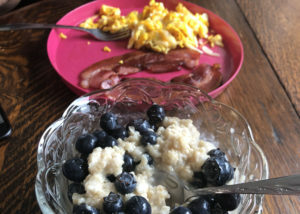 According to a quick Google search I performed when he first decided to do this, there is such thing as a vegan keto diet, but he felt that if he was going to restrict carbs, he was at least going to eat meat, dairy and eggs. 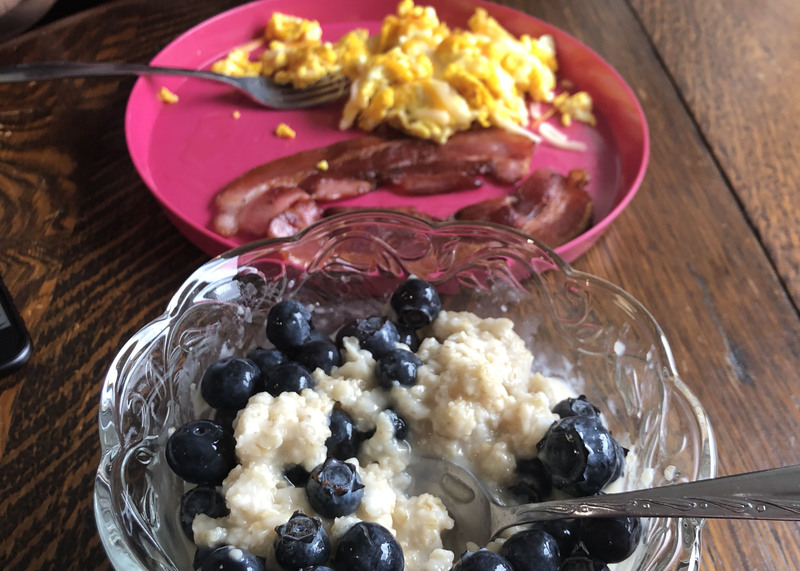 So this morning Hubby began his keto diet with bacon, eggs and cheese — all the delicious stuff I’ve decided not to eat anymore. And then at lunch, he had even more bacon! 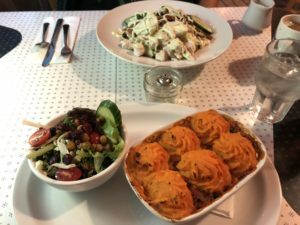 This time as part of a cobb salad at the Blue Plate Diner in Edmonton — where miraculously we could both fulfil our dietary restrictions. But as he pointed out, the grass is always greener on the other side: he couldn’t keep his eyes off the sweet potatoes topping my veggie shepherd’s pie. I also got to have a cupcake when we went for tea later in the day, but with keto vetoing sugar he can’t really have dessert anymore. The smell of meat once again wafted through the house before dinner. 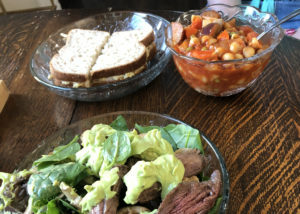 Hubby made himself a steak salad with mushrooms and avocado dressing while I had leftover alphabet soup (from Isa Does It by Isa Chandra Moskowitz) — but with tiny shell noodles instead of alphabet noodles — and a go-to chickpea salad sandwich (from Fuss-Free Vegan by Sam Turnbull). Fortunately, I’ve never been very tempted by steak, but tomorrow — The Return of the Bacon!